Healthy Soup Recipes, nutritious and satisfying food for easy meals. My healthy soup recipes are the result of the challenge to overcome illness through good nutrition. Remaking recipes without lots of animal products has been well worth the time and effort. 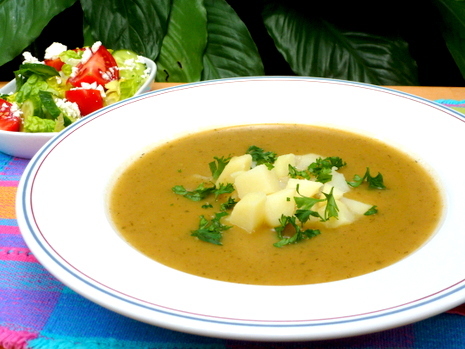 The result is nutritious soups that are tasty and satisfying. The broth of the soup is the most important part of making any soup, but especially in healthy soup recipes. If the broth is flavorless, you are not going to end up with a product that you will enjoy eating. A delicious broth can be made from aromatic vegetables and a mixture of herbs to round out the flavor. A small amount of animal product used as a condiment to flavor is okay, if you are healthy and not trying to recover from chronic disease. The vegetables that I use are fresh or frozen ones with the exception of some canned tomatoes and canned beans...organic ones are preferred. The addition of beans, potatoes, corn and vegetables of all colors will continue to enhance the preparation of healthy soup recipes to a full and hearty flavor. A hearty soup for a busy day! Making the soup a day or two ahead of when you need to use it for a meal will definitely enhance the flavors even more. Soups under refrigeration will easily keep for a week. Having soups already prepared for a meal will help keep you away from unhealthy and expensive fast foods. 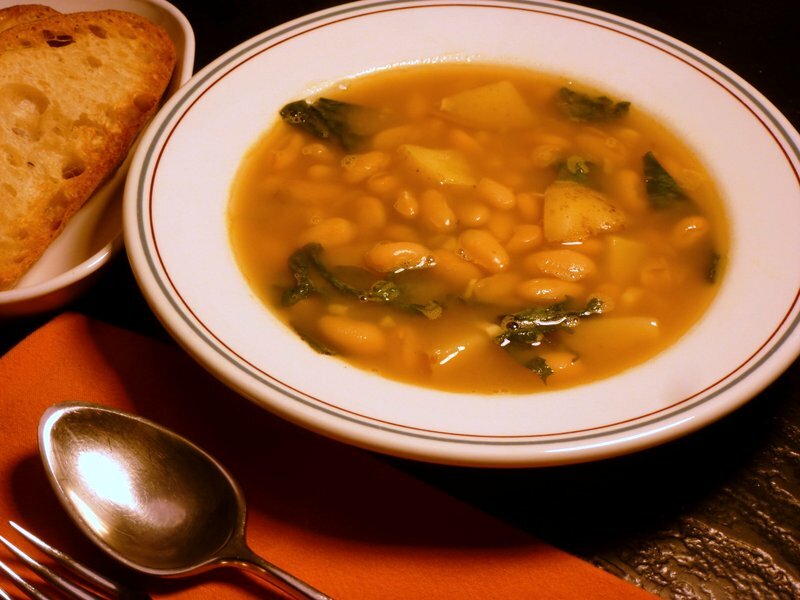 Beans, potatoes and escarole make an excellent soup! What type of pot is best to use? Stainless steel is preferable over other metals and coatings that are on the market today. A 5 quart pot sometimes referred to as a "dutch oven" (if you only have one size) is ideal to accommodate a variety of soup recipes. A good soup pot does not need to be expensive, but the bottom of the pot should be thick. A thick and creamy soup! Lucky you, if you have a vegetable garden! A few more tips for adding flavor to plant based soups! A note about Bragg Liquid Aminos: I use this in almost all my recipes such as soups, stews, salad dressings, dips, sauces, gravy, rice dishes. It is a healthier way to season your food than with table salt. Click here to learn more...excellent salt substitute. Adding sherry to recipes: I do not use "cooking sherry" because it is loaded with salt. Use regular dry sherry (or red or white wine)...but not something that is sweet. If you decide to use sherry in your cooking, you don't have to worry about alcohol, because the cooking will remove this and just leave additional flavor. I find this important when I am trying to build taste into the dish I am preparing. 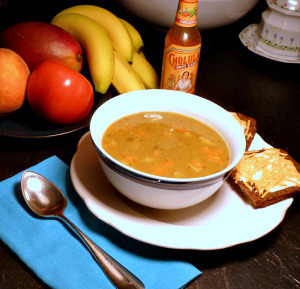 Colgin Liquid Smoke is a wonderful addition to vegetarian soups or stews. A little bit goes a long way in flavoring your recipe. I refrigerate this product, and it lasts a long time. Low sodium products: I try to purchase products with low sodium, when possible, because I would rather add my choice of sodium to a recipe which I believe to be a healthier product. 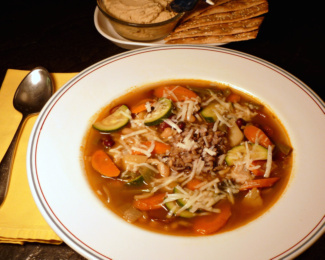 I hope these ideas will help you find soups you enjoy on a regular basis. Here is to healthy eating! Salads - Start you salads with dark green leafy vegetables to make you diets rich in antioxidants and phytochemicals which protect your body from free radicals. Healthy Sides - Our easy vegetable recipes are made up of simple ingredients cooked just enough in order to bring out the best flavor of each vegetable.